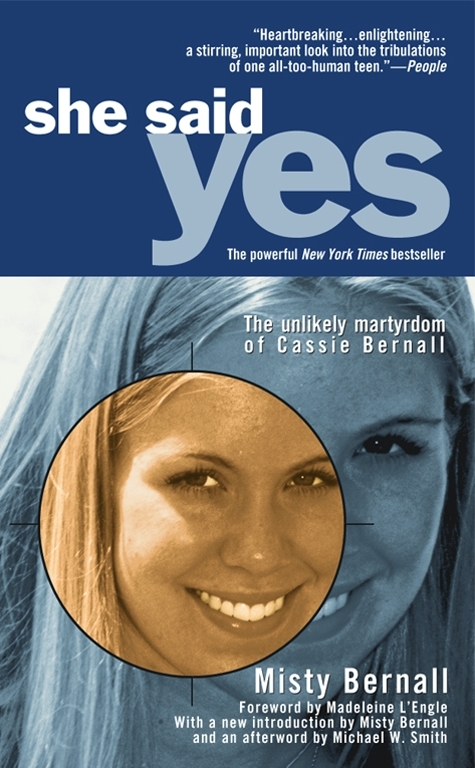 "One of the most gripping stories to come out of the shooting at Columbine High School"
is told in the acclaimed national bestseller that illuminates the most remarkable aspect of 17-year-old Cassie Bernall's tragic death: her life. She Said Yes is an "intense and fascinating memoir" (Publishers Weekly) of an ordinary teenager growing up in suburban Colorado, and faced -- as all teenagers are -- with difficult choices and pressures. It is only now, when the world knows Cassie Bernall as one of the Columbine High students killed by two rampaging schoolmates, that the choices she made offer a profound relevance for us all. Once a rage-filled young woman who walked a path similar to that of her killers, Cassie found a way out of her personal snares and, through her faith and a family's love, chose to embrace life with courage and conviction. Told with unflinching honesty by her mother, Misty Bernall, Cassie's story is "a profoundly human story that should be read by every parent and every teenager" (New York Post). Misty Bernall is the mother of Cassie Bernall, a victim of the Columbine high school shooting. She lives in Littleton with her husband. Dr. Laura Schlessinger This story teaches a striking lesson to parents and young people everywhere. Johann Christoph Arnold, author of Seeking Peace She Said Yes is gripping, challenging, and encouraging. Gripping because of the drama. Challenging, because it reminds us how important it is to live each day as if it were our last. Encouraging, because it shows that even the most strained family relationship can be saved by love. The Denver Post A highly personal tale of...a teenager's search for her identity, and hope...during the darkest days. People The story is far more complicated and enlightening than the tiny martyrdom imposed on Cassie after her death....A poignant wake-up call to parents. Publishers Weekly She Said Yes shows how a troubled teenager can be helped, though Misty Bernall doesn?t hold back when describing the emotional toll the process can take. Although she doesn?t see her daughter as a martyr, Bernall concludes that Cassie?s death was, indeed, a triumph of honesty and courage. This powerful memoir honors that courage and reveals Misty Bernall?s own. Christianity Today A story that will chill the heart of every parent, but also bring a strong gust of hope. New York Post Gripping....It?s hard to think of a book that so plainly or powerfully provides families with wisdom for surviving conflict with their souls and sanity intact. Time We expect martyrs to be etched in stained glass, not carrying a backpack and worrying about their weight and their finals. Cassie?s is a mystery story, the story of a girl lost to bad friends and drugs and witchcraft and all the dark places of teenage rebellion. The New York Times Though her final act might strike people as extraordinary...she was in many ways just another teenager. Chicago Tribune From time to time, an example of true moral heroism shows us a case in which someone has the wisdom to recognize a moral imperative and the fortitude to act upon it. When the case involves someone as young and courageous as Cassie Bernall, it is more than heartening; it is humbling and awe-inspiring.